By default, Indians are multilingual - they normally know their mother tongue (Regional language), Hindi (considered as national language, though all Indian languages enjoy equal status according to our constitution) and English (which is taught in school). Most schools introduce foreign languages like French, German, Spanish, and now even Mandarin, around the age of 13-14 years. Therefore, for an Indian, learning a new language is not as difficult as for a monolingual person! 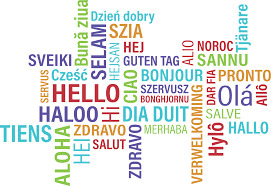 D. Scientific translation - to maximize the reach of new inventions, research papers and patents, they need to be translated from their source language, into the major world languages. E. Website translation- for businesses to grow in new markets, website localization is the first step. It is a proven fact that customers prefer their own language to any foreign/regional language while transacting online. A. Consecutive interpretation- the interpreter waits for the end of the original sentence or statement to deliver the interpretation. B. Simultaneous interpretation - interpreting the speech or message from the source language to target language simultaneously while the speech is going on. It is used for large gatherings (i.e. the speaker and the interpreter speak at the same time - the interpreter hears the speech through earphones and speaks through microphones, and the interpretation is heard on ear phones by the listeners). Language Training -(individual/corporate)- Schools, colleges, universities, management and international trade institutes, multi-national companies, etc. require experienced and knowledgeable trainers for various languages, and this requirement is ever-increasing. Content writing - (for advertising material, websites, etc.) is typically creating content in a given language for the web, for ads, etc., such that the product/website/event etc. sells - the language is impressive and the reader is impressed on reading it, and unknowingly develops a preference to it. Localization and internationalization - (of products, websites, games, audio-visuals, etc.) Localisation, more than just translating the content, involves transforming a product, product information, commercial e-literature, etc. to suit a particular culture. This connects an organisation with the local end user. Eg. usage of some symbols or colors is considered a taboo in some markets. Similarly, Internationalizing products, services, websites and other text, that is, offering it in multilingual form widens its reach onto the international market.